The rubber gloves are used in her work to signify those who may be involved in some type of dirty work they don’t want to be made liable for or, for those who are trying to protect themselves from something harmful. 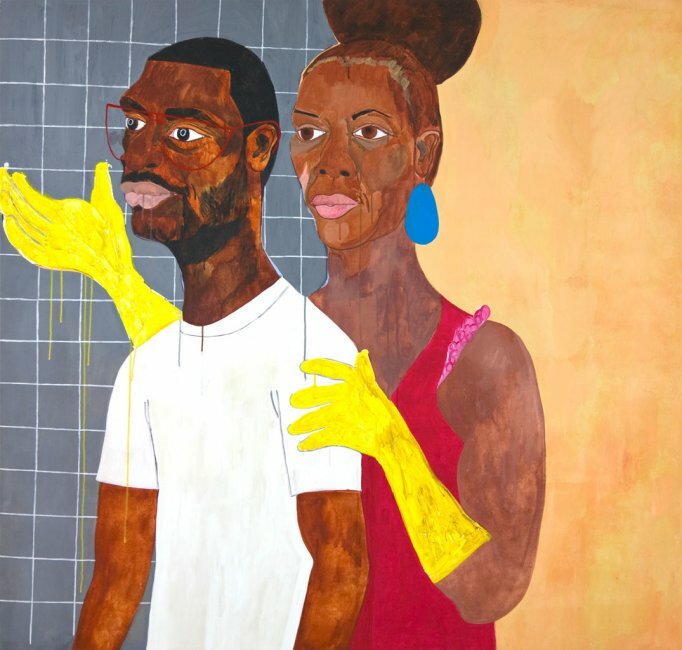 Nina’s boldly colorful acrylic paintings began to grow in size at the encouragement of a college professor who suggested that she work large-scale. A picture of her studio showed the walls covered with enormous canvasses of works in progress. She also creates smaller watercolors as a relief from her primary work. Nina’s work brings together influences from political, social, and cultural issues while purposely distorting their original focus or meaning. At times Nina forces us to face typical societal stereotypes, offering a playful view that though surreal is painfully all too real. 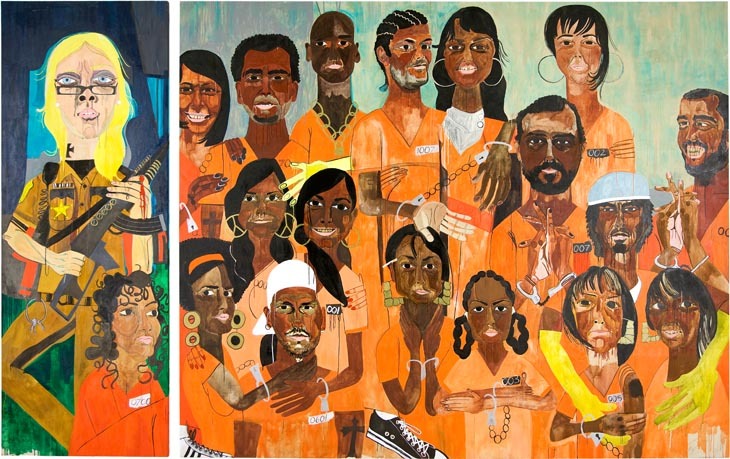 I adore her senior class thesis painting “Class of 2007” in which she painted her classmates black while she, the only African-American in her class is displayed as white. I do identify as I recall my college days of often being the only “one.” When creating, she has a definite path of where the painting is going—yet there is no point of assuming you have a handle. According to Nina the work flows better when she creates intuitively at the canvas never really planning ahead what she is going to do. However, once she gets started she does gather information from research, newspapers, the Internet, etc., for reference. It seems Nina may continue to work in a state of flux to keep the viewer ever wondering. I dig that about her! This entry was posted in Art/Current Events and tagged acrylic, Art/Current Events, class of 2007, distorted, Khaaliqua and Jeff, large-scale, MAM, Nina Chanel Abney, political, racial, rubber gloves, societal. Bookmark the permalink.